Back in May of 2013, I migrated to a new web host which would not host the hundreds of audio podcasts I’d published since 2005. I needed to find a separate hosting company for my podcasts, and I opted to go with Amazon S3. My friend, James Deaton (@jed), had educated me about the benefits of Amazon web services a few years before, when I needed a caching plugin and tried W3 Total Cache using Amazon Cloudfront. Since then I’ve discovered Zen Cache (a far simpler and equally powerful solution) for WordPress caching but I’ve stuck with Amazon S3 for my podcast hosting. Today I received a question via Twitter about my Amazon S3 podcast hosting costs. In this post I’ll try to provide a window into these monthly costs and the transfer amounts to which they correspond. @wfryer Saw an old article of yours about podcast bandwidth; it mentioned you were using S3. Got any resources to calculating S3 costs? As far as I know there is not a straightforward online calculator for Amazon S3 hosting costs. I publish my audio podcasts at 32 Kbps, to keep the file download sizes small. If you publish at a higher quality, your bandwidth/transfer costs are higher. The following screenshot is a summary graph of my Amazon charges for most of 2015. (All months except January.) The highest month was September, when I paid about $4.50. The lowest month was February, when my bill was just over $2.00. The amazing thing is that even though my monthly podcast hosting charges from Amazon were less than $5 per month, the amount of transfer bandwidth and storage I paid for each month was relatively large. Here is the breakdown in costs and bandwidth/storage I paid for in the month of September, to provide some further context. 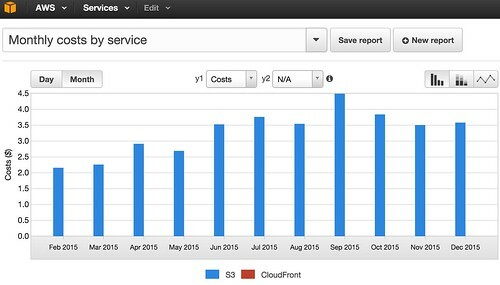 The screenshot above shows the breakdown in monthly Amazon costs by service. 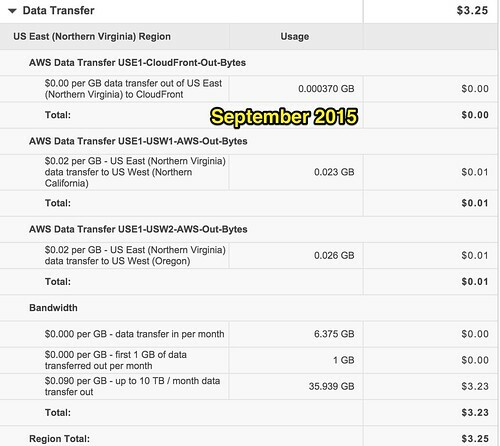 I paid $1.27 for the hosting of my podcast files (and a few other files) on Amazon S3, and $3.25 for data transfer. Data transfer reflects the amount of bandwidth utilized when my podcasts were downloaded by others. 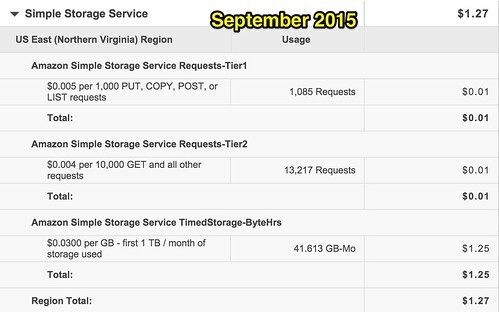 The screenshot above (the third in this series) shows in September 2015, 41.6 GB of podcasts were being hosted on Amazon S3. I was charged at the remarkable rate of only 3 cents per GB. $1.27 to host all my podcasts to date in the Amazon cloud. The final screenshot above (the fourth) shows the amount of monthly bandwidth or downloads of my podcasts in September 2015: 35.9 GB. This cost $3.25 for the month, charged mainly at the rate of 9 cents per GB. As far as I have been able to figure out, there is not a way for me to directly view aggregated statistics which can answer questions like, “Which podcast episodes were downloaded the most?” I know there are some third party services which can process Amazon S3 transfer logs and generate reports, but I’ve never given any of those a try. If you’re looking for an affordable host for your podcasting files, I definitely think Amazon S3 is worth considering. If I wasn’t using it, I’d probably be using LibSyn. I think, however, that would probably cost more than what I’m paying now to Amazon. If you have any further insights on the analysis and recommendations I’ve provided here, please share them as a comment to this post or as a Twitter reply to @wfryer. This is indicative of a relatively small show. The high majority of shows would see very different bills. Plus the podcasters is encoding at 32kbps which was the standard 10 years ago.. The high majority of podcasters today record at 96 or 128kbps. Anyone considering hosting on Amazon would need to take there show total downloads for all episodes created in 1 month, and multiply that by the average file size and come up with total GB then multiply that by the S3 rate.. I would love to be able to see and show the stats for “total downloads for all episodes created in 1 month.” Can you direct me to a link that explains how to do this? I did some searching and found https://www.s3stat.com – I’ve setup a free trial account and will see what I can learn in terms of file download totals. Their service should generate those reports for me now.